A join method is the mechanism for joining two row sources. Join optimizations enable joins to be more efficient. The optimizer must make the interrelated decisions shown in the following table. As for simple statements, the optimizer must choose an access path to retrieve data from each table in the join statement. For example, the optimizer might choose between a full table scan or an index scan..
To join each pair of row sources, Oracle Database must decide how to do it. The "how" is the join method. The possible join methods are nested loop, sort merge, and hash joins. A Cartesian join requires one of the preceding join methods. Each join method has specific situations in which it is more suitable than the others. The join condition determines the join type. For example, an inner join retrieves only rows that match the join condition. An outer join retrieves rows that do not match the join condition. The optimizer estimates the cost of a query plan by computing the estimated I/Os and CPU. These I/Os have specific costs associated with them: one cost for a single block I/O, and another cost for multiblock I/Os. Also, different functions and expressions have CPU costs associated with them. The optimizer determines the total cost of a query plan using these metrics. These metrics may be influenced by many initialization parameter and session settings at compile time, such as the DB_FILE_MULTI_BLOCK_READ_COUNT setting, system statistics, and so on. Conceptually, the optimizer constructs a matrix of join orders and methods and the cost associated with each. For example, the optimizer must determine how best to join the date_dim and lineorder tables in a query. The following table shows the possible variations of methods and orders, and the cost for each. In this example, a nested loops join in the order date_dim, lineorder has the lowest cost. Depending on the statistics, the optimizer chooses the method with the lowest estimated cost. As shown in Figure 9-5, each join method has two children: the driving (also called outer) row source and the driven-to (also called inner) row source. Nested loops join an outer data set to an inner data set. For each row in the outer data set that matches the single-table predicates, the database retrieves all rows in the inner data set that satisfy the join predicate. If an index is available, then the database can use it to access the inner data set by rowid. The outer loop of a nested loop can itself be a row source generated by a different nested loop. Oracle Database 11g introduced a new implementation for nested loops that reduces overall latency for physical I/O. 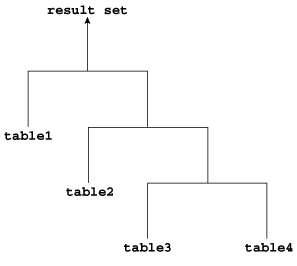 For some SQL statements, the data is small enough for the optimizer to prefer full table scans and hash joins. However, you can add the USE_NL hint to instruct the optimizer to join each specified table to another row source with a nested loops join, using the specified table as the inner table. When an index or a table block is not in the buffer cache and is needed to process the join, a physical I/O is required. The database can batch multiple physical I/O requests and process them using a vector I/O (array) instead of one at a time. The database sends an array of rowids to the operating system, which performs the read. An outer join returns all rows that satisfy the join condition and also rows from one table for which no rows from the other table satisfy the condition. Thus, the result set of an outer join is the superset of an inner join. A semijoin is a join between two data sets that returns a row from the first set when a matching row exists in the subquery data set. An antijoin is a join between two data sets that returns a row from the first set when a matching row does not exist in the subquery data set. A band join is a special type of nonequijoin in which key values in one data set must fall within the specified range (“band”) of the second data set. 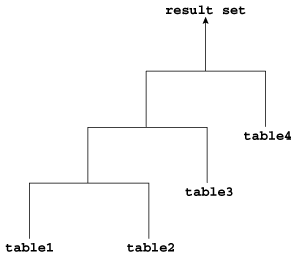 The same table can serve as both the first and second data sets. Starting in Oracle Database 12c Release 2 (12.2), the database evaluates band joins more efficiently. The optimization avoids the unnecessary scanning of rows that fall outside the defined bands. The optimizer uses a cost estimate to choose the join method (hash, nested loops, or sort merge) and the parallel data distribution method. In most cases, optimized performance is comparable to an equijoin. In this plan, Step 2 sorts the e1 row source, and Step 5 sorts the e2 row source. The sorted row sources are illustrated in the following table. For each iteration of the sorted row source e1, the database iterates through row source e2, checking every row against Step 5 filter e1.sal >= e2.sal–100. If the row passes the Step 5 filter, then the database sends it to the Step 4 filter, and then proceeds to test the next row in e2 against the Step 5 filter. However, if a row fails the Step 5 filter, then the scan of e2 stops, and the database proceeds through the next iteration of e1. The following table shows the first iteration of e1, which begins with 24000 (King) in data set e1. The database determines that the first row in e2, which is 24000 (King), passes the Step 5 filter. The database then sends the row to the Step 4 filter, e1.sal <= w2.sal+100, which also passes. The database sends this row to the MERGE row source. Next, the database checks 17000 (Kochhar) against the Step 5 filter, which also passes. However, the row fails the Step 4 filter, and is discarded. The database proceeds to test 17000 (De Haan) against the Step 5 filter. 24000 (King) Pass because 24000 >= 23900. Send to Step 4 filter. Pass because 24000 <= 24100. Return row for merging. 17000 (Kochhar) Pass because 24000 >= 16900. Send to Step 4 filter. Fail because 24000 <=17100 is false. Discard row. Scan next row in e2. 17000 (De Haan) Pass because 24000 >= 16900. Send to Step 4 filter. Fail because 24000 <=17100 is false. Discard row. Scan next row in e2. 14000 (Russell) Pass because 24000 >= 13900. Send to Step 4 filter. Fail because 24000 <=14100 is false. Discard row. Scan next row in e2. 13500 (Partners) Pass because 24000 >= 13400. Send to Step 4 filter. Fail because 24000 <=13600 is false. Discard row. Scan next row in e2. As shown in the preceding table, every e2 row necessarily passes the Step 5 filter because the e2 salaries are sorted in descending order. Thus, the Step 5 filter always sends the row to the Step 4 filter. Because the e2 salaries are sorted in descending order, the Step 4 filter necessarily fails every row starting with 17000 (Kochhar). The inefficiency occurs because the database tests every subsequent row in e2 against the Step 5 filter, which necessarily passes, and then against the Step 4 filter, which necessarily fails. The difference is that Step 4 uses Boolean AND logic for the two predicates to create a single filter. Instead of checking a row against one filter, and then sending it to a different row source for checking against a second filter, the database performs one check against one filter. If the check fails, then processing stops. In this example, the query begins the first iteration of e1, which begins with 24000 (King). The following figure represents the range. e2 values below 23900 and above 24100 fall outside the range. Description of "Figure 9-7 Band Join"
The following table shows that the database tests the first row of e2, which is 24000 (King), against the Step 4 filter. The row passes the test, so the database sends the row to be merged. The next row in e2 is 17000 (Kochhar). This row falls outside of the range (band) and thus does not satisfy the filter predicate, so the database stops testing e2 rows in this iteration. The database stops testing because the descending sort of e2 ensures that all subsequent rows in e2 fail the filter test. Thus, the database can proceed to the second iteration of e1. Passes test because it is true that (24000 >= 23900) AND (24000 <= 24100). Send row to MERGE. Test next row. Fails test because it is false that (24000 >= 16900) AND (24000 <= 17100). Stop scanning e2. Begin next iteration of e1. In this way, the band join optimization eliminates unnecessary processing. Instead of scanning every row in e2 as in the unoptimized case, the database scans only the minimum two rows. Outer joins require the outer-joined table to be the driving table. In the preceding example, employees is the driving table, and departments is the driven-to table. The optimizer uses hash joins for processing an outer join when either the data volume is large enough to make a hash join efficient, or it is impossible to drive from the outer table to the inner table. A full outer join is a combination of the left and right outer joins. 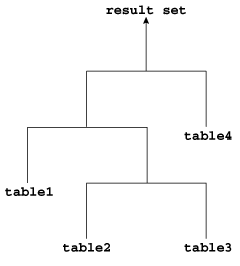 In Oracle Database 12c, multiple tables may exist on the left side of an outer-joined table. In addition to the inner join, rows from both tables that have not been returned in the result of the inner join are preserved and extended with nulls. In other words, full outer joins join tables together, yet show rows with no corresponding rows in the joined tables. The database stops processing the second data set at the first match. Thus, optimization does not duplicate rows from the first data set when multiple rows in the second data set satisfy the subquery criteria. A semijoin avoids returning a huge number of rows when a query only needs to determine whether a match exists. The semijoin optimization is implemented differently depending on what type of join is used. With large data sets, this optimization can result in significant time savings over a nested loops join that must loop through every record returned by the inner query for every row in the outer query. The optimizer can apply the semijoin optimization to nested loops joins, hash joins, and sort merge joins. Like a semijoin, an antijoin stops processing the subquery data set when the first match is found. Unlike a semijoin, the antijoin only returns a row when no match is found. An antijoin avoids unnecessary processing when a query only needs to return a row when a match does not exist. The antijoin optimization is implemented differently depending on what type of join is used. For semijoins, IN and EXISTS are functionally equivalent. However, NOT IN and NOT EXISTS are not functionally equivalent because of nulls. With large data sets, this optimization can result in significant time savings over a nested loops join. The latter join must loop through every record returned by the inner query for every row in the outer query. The optimizer can apply the antijoin optimization to nested loops joins, hash joins, and sort merge joins. The ANTI SNA stands for "single null-aware antijoin." ANTI NA stands for "null-aware antijoin." The null-aware operation enables the optimizer to use the antijoin optimization even on a nullable column. In releases earlier than Oracle Database 11g, the database could not perform antijoins on NOT IN queries when nulls were possible. The optimizer uses a Cartesian join for two row sources only in specific circumstances. A Cartesian join uses nested FOR loops. A Bloom filter, named after its creator Burton Bloom, is a low-memory data structure that tests membership in a set. 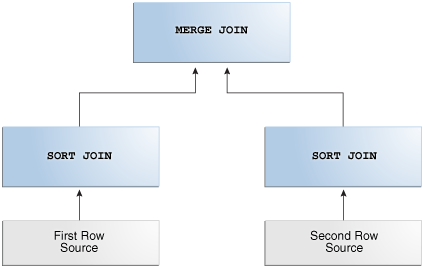 A join group is a user-created object that lists two or more columns that can be meaningfully joined. A Bloom filter correctly indicates when an element is not in a set, but can incorrectly indicate when an element is in a set. Thus, false negatives are impossible but false positives are possible. A Bloom filter tests one set of values to determine whether they are members another set. A Bloom filter uses an array of bits to indicate inclusion in a set. 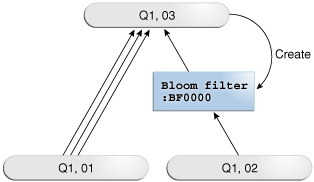 The optimizer automatically determines whether to use Bloom filters. V$ views contain metadata about Bloom filters. For example, one set is (10,20,30,40) and the second set is (10,30,60,70). A Bloom filter can determine that 60 and 70 are guaranteed to be excluded from the first set, and that 10 and 30 are probably members. Bloom filters are especially useful when the amount of memory needed to store the filter is small relative to the amount of data in the data set, and when most data is expected to fail the membership test. To override optimizer decisions, use the hints PX_JOIN_FILTER and NO_PX_JOIN_FILTER. 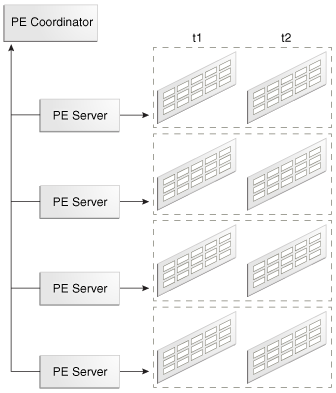 Description of "Figure 9-8 Bloom Filter"
Partition-wise joins reduce query response time by minimizing the amount of data exchanged among parallel execution servers when joins execute in parallel. This technique significantly reduces response time and improves the use of CPU and memory. 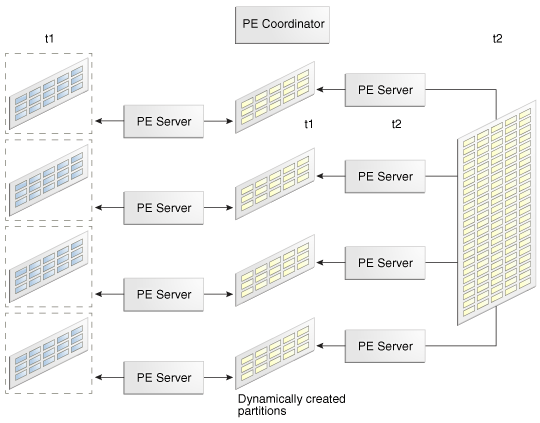 In Oracle Real Application Clusters (Oracle RAC) environments, partition-wise joins also avoid or at least limit the data traffic over the interconnect, which is the key to achieving good scalability for massive join operations. 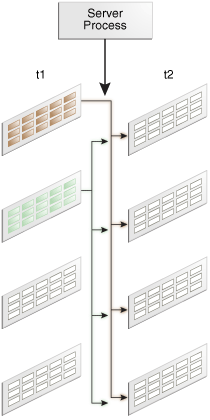 Description of "Figure 9-9 Join That Is Not Partition-Wise"
Description of "Figure 9-10 Full Partition-Wise Join in Parallel"
Description of "Figure 9-11 Partial Partition-Wise Join"
In certain queries, join groups eliminate the performance overhead of decompressing and hashing column values. Join groups require an In-Memory Column Store (IM column store).